Capital Projects provides an empirically-based framework for capital project strategy and implementation, based on the histories of over 20,000 capital projects ranging from $50,000 to $40 billion. Derived from the detailed, carefully normalized database at preeminent project consultancy IPA, this solid framework is applicable to all types of capital investment projects large and small, in any sector, including technology, life sciences, petroleum, consumer products, and more. Although grounded in empirical research and rigorous data analysis, this book is not an academic discussion or a conceptual dissertation; it's a practical, actionable, on-the-ground guide to making your project succeed. Clear discussion tackles the challenges that cause capital projects to fail or underperform, and lays out exactly what it takes to successfully manage a project using real-world methods that apply at any level. Businesses report that 60 percent of their projects fail to meet all business objectives, and IPA's database shows that projects' final average net present value undershoots initial estimates by 28 percent. This book provides concrete, actionable solutions to help you avoid the pitfalls and lead the way toward a more positive outcome. 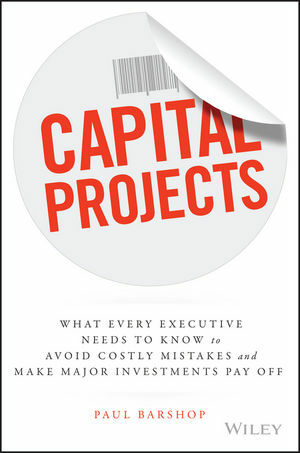 When capital projects fail, it is almost always preventable. Inefficiency, underestimated timelines, and unforeseen costs are the primary weights that drag a project down—and they are all avoidable with good management. Capital Projects gives you the insight and practical tools you need to drive a successful project. PAUL BARSHOP, Director, IPA Capital Solutions, provides hands-on support to companies who are seeking to realize more value by enhancing their capital project development and delivery systems. Previously, he served as both IPA's chief operating officer and director of its Europe, Middle East, and Africa region. He has authored numerous articles for industry trade journals and IPA subscription newsletters.